Well, it's not always that long, but we decided to take the route through western New South Wales and Queensland. Day 2 - at Griffith, we bought oranges and broccoli from a Sicilian roadside merchant who arrived in Moonee Ponds in 1964. Along the roadside, we started noticing lots of white litter which turned out to be balls of cotton- for 100 kms perhaps. We spotted emus frequently but whenever we pulled over to take a photo, they would move off quite quickly. 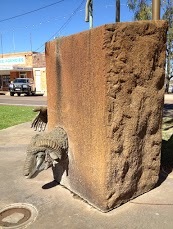 Back o' Bourke - there are dead roos (red and greys) at least every half a kilometre. In town, whistling kites circling overhead. Street trees: ficus and boabs along with other eucalypts. 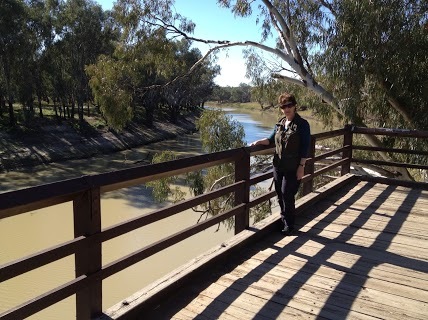 At the Port of Bourke the river banks are high and steep - with levy banks beyond them - an indication of regular if infrequent huge floods though houses have been built right near the banks. In Charleville the sulphur smell is obvious when you turn a tap on - the sign on the bench in the motel room assured us that the water is fine to drink. The road trains are 50 metres long with as many as 3 trailers. I noticed several stock transports actually carrying goats! Maybe all those goats we saw on the road here were not feral! The rest of the vehicles are caravans and camper vans pulled by Grey Nomads touring the country. 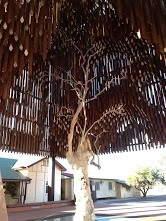 We didn't see inside the Workers' Heritage centre at Barcaldine but the timber sculpture over the Tree of Knowledge was impressive and the heritage streetscape of old hotels was well preserved. Every town around here (Longreach, Charleville and Winton) claims the birth of Qantas (Queensland and Northern Territory Airways). But Winton owns the famous song, Waltzing Matilda. 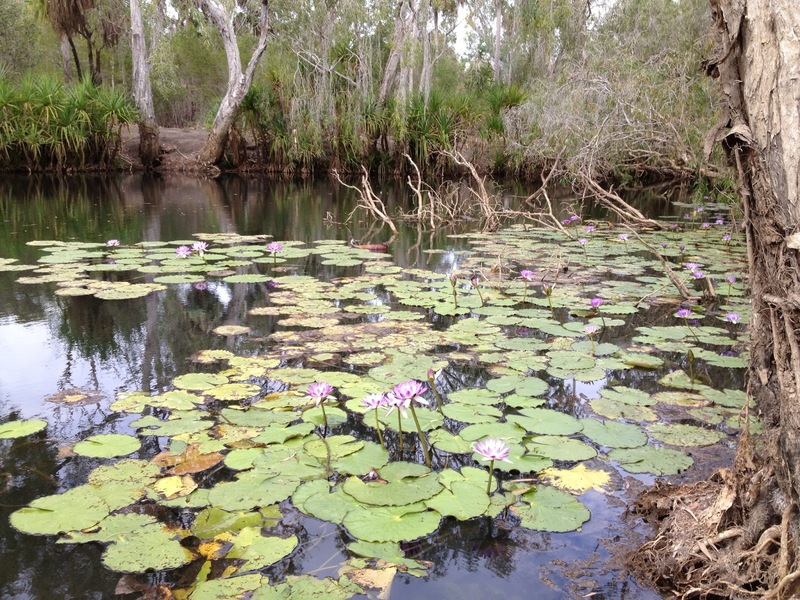 Here is a great 'Queensland' version of Waltzing Matilda on Youtube. And here are the words to the song (the lyrics). The landscape is empty of stock and even the roo carcasses are fewer here too. Whilst we ate a sandwich prepared on the tailgate at a roadside servo called Kynuna we were entertained by Apostlebirds scrounging Crumbs. I tried to ignore the cattle in the road train shuffling around impatiently and occasionally moo-ing sadly. Then as we accelerated out on to the highway we watched a pair of brolgas wandering along in the gravel. Where's the water? This country is starting to look hot, even when it's not- red anthills, ghost gums, broad sandy riverbeds and whistling kites overhead. 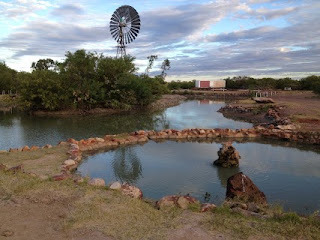 Day 7 - From rural outback Queensland to the Northern Territory via the Barkly Tablelands and the Stuart highways. There was a whole lot of nothing between Camooweal, Barkly homestead and the Stuart highway. The days are getting longer- this is what we observed at 6 pm whilst preparing dinner outside our rustic motel room at Renner. However, the mozzies drove us inside at dusk. Days 8 and 9 - Mataranka Hot Springs - delightfully warm, mild weather - Time to stretch and relax! The whole springs area has been cleverly arranged (back in 1999) so that everyone steps into the clear blue water of the Little Roper River at one point and floats down on the current to another entry about 70 metres downstream and then you all walk back to the start and go in again, as often as you like. This was so pleasant and relaxing that we decided to spend the next day doing the same, to stretch our sore back muscles from the constant and long days spent driving.